Abstract: The sensitivity of human hearing underwater for a ‘wet’ ear has been measured. A total of 21 subjects underwent an underwater audiogram in an acoustic water tank at DRA Alverstoke. A high quality underwater loudspeaker provided pure tone sound stimuli at the third octave band centre frequencies from 25 Hz to 16 kHz. The results have enabled the underwater threshold of hearing to be defined. The most sensitive hearing frequency was 800 Hz, and at a level of 41 dB SPL re.20mPa. There is a general loss in hearing sensitivity underwater, which is most pronounced at frequencies above 2kHz and as a consequence, low frequency sound plays the greatest role in underwater sound perception by divers. Consequently, a higher level of noise is permissible underwater than would be permissible in the air. An example is presented of the use of a new underwater weighting scale, the dB(UW), as a means of assessing underwater noise hazard. Abstract: Scientific Diving techniques were employed during a 54 day oceanographic research cruise to the Bellingshausen Sea, Southern Ocean (65°S−72°S, 80°W−87°W), in order to position sampling and data collecting instrumentation beneath sea ice. Eight Scientific Divers and a Field Diving Officer safely completed 112 individual dives (range 2−80 minutes, 2−28 m); 94 of these were roped dives through holes cut in 1 m thick sea ice. Seawater temperature was −1.8°C, horizontal visibility 30 m+ and water depth 600m or more. No problems were encountered with the diving equipment used. Diving techniques enabled the collection of an important data set describing the dynamics of phytoplankton and zooplankton growth beneath sea ice. Recommendations for future under–ice oceanic scientific diving include the use of dive tables with ascent rates of less than 15 m/min, the provision for therapeutic oxygen at the dive site, and adequate shelter for surface tenders. Abstract: The Mary Rose was built between 1509 and 1511 and was a highly successful warship until she capsized and sank in the Solent in July 1545. In 1982, after many years of painstaking search and investigation, the Mary Rose was recovered from the sea bed with unprecedented interest and support from the public. In this paper, some of the problems associated with raising a fragile structure which also has great archaeological and historical importance are described, and aspects of the salvage programme are given from the perspective of one of the archaeological divers involved with the raising of the Mary Rose. Finally, the importance of integrating the professions of both salvage and archaeology in such an operation is illustrated. Abstract: This paper discusses recent fundamental and applied work investigating the damping forces induced on floating vessels and in particular catenary mooring lines. A description of new tests being performed at University College London on large scale sections of mooring line to reveal damping contributions is also presented. The contributions to damping from the mooring lines is high topical in that a number of floating product and storage units are currently being planned for hydrocarbon exploitation. Indeed a number of schemes are already in operation at North Sea sites. Design of the mooring system required to hold the vessel within a specified radius above the wellhead depends on an understanding of the imposed static and dynamic environmental loads. The low frequency excitation caused by the random waves, and, to a certain extent, wind loading results in resonant motion responses in the horizontal plane leading to high mooring line forces. Many of the loading mechanisms are well understood. However, until recently the fluid induced forces acting on the moorings were assumed to have little influence on the vessel dynamic response. Recent work has shown that the mooring system may under certain circumstances provide up to 80% of the total damping available thus significantly reducing the peak line tensions. 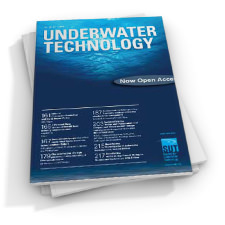 Abstract: Severely limited underwater viewing remains a problem in the operation of remotely operated vehicles. The recent availability of compact, diode–pumped green lasers has led to a renewed interest in the synchronous volume scanning technique as a means of overcoming some of the viewing problems. However, one of the limitations with synchronous scanning is the limited depth of field achieved because of the optical arrangement used. In an attempt to overcome this problem, an underwater laser illumination system has been developed at Cranfield University. Stripes of laser light are used to illuminate a target and images from a conventional camera are processed to produce a computer generated composite image. The system has been evaluated in an underwater laboratory and at various open–water sites. Such a computer–integrated approach to underwater viewing has applications in areas such as macro– and micro–navigation and these are discussed. Abstract: This paper summarises the findings of a major study into the feasibility of using rapid tidal currents to generate electricity in Orkney and Shetland. The theory of tidal generation is briefly summarised and economic, social and environmental factors outlined. Abstract: Practical trials using fresh water, which is about 2% less dense than sea water, as a buoyancy medium in sea water are described. A modified hot–air balloon was attached underwater to a load of 4.7 tons and filled with fresh water pumped down from the surface. Very delicate control of the lifting force could be achieved; the prolonged, steady force overcame bottom suction and the inertia and drag of the balloon largely restricted the acceleration and rates of ascent and descent. Features of the method relevant to practical applications are also discussed. Balloons capable of 1000 tons life can be built and operated at any depth using readily available pumps and hoses, and a tanker for the fresh water will be considerably cheaper to hire than a lifting barge. Station–keeping by the surface vessel will be simplified, since it will not need to be vertically above the load. Although currents could cause significant problems, it appears that in certain applications, particularly those involving very heavy loads at great depths, this method will have significant advantages over conventional techniques. 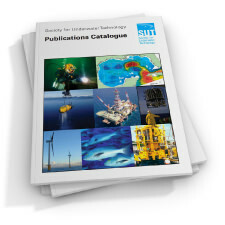 Abstract: Within the next few years, the offshore oil industry will be seeking to exploit hydrocarbon reserves at depths inaccessible to saturation divers, and at which the welding processes currently in offshore use will not operate. Alternative processes exist for the water depth range 500 to 1000 metres, and these have been shown to be viable in laboratory trials. 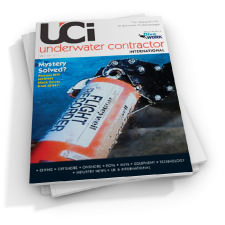 Further work is required to bring them to full operational status, and to integrate them with the wide range of other equipment required to carry out a complete underwater fabrication procedure without diver intervention. Although alternative fabrication techniques exist, it is generally agreed that if hyperbaric welding can be shown to be reliable, and to produce acceptable joints, it will continue to be used by the offshore industry. At present, no facilities exist for hyperbaric welding research at depths significantly greater than 1000 metres. Cranfield is currently commissioning a 250 bar research facility, which can be used for undertaking studies into the performance and properties of arc welding at pressures equivalent to a water depth of 2.5km. 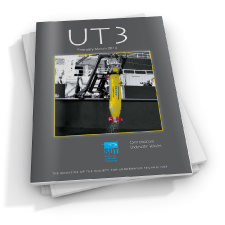 Abstract: The need for clear communications between diver and topside is obvious; safe practices depend on good communications, as do efficient operations and effective response to an emergency. The requirements of communications systems have only recently been formalised. The rationale behind the design of communications tests are presented and some of the problems which arise when these tests are applied to the specific problems of helium speech are discussed. These results suggest that investing large sums of money to design new unscramblers may be wasteful and much small investments, to produce integrated systems to suit the particular space in which each will be used, will give much greater improvements in intelligibility. Abstract: A programme of experimental work has been carried out under the ‘Umbilicals―the Future’ joint industry umbilical research project, in which the behaviour of thermoplastic hoses in response to rapid pressure changes has been examined in detail. The hose characteristics which have been investigated include steady state volumetric expansion, ageing, visco–elasticity and dynamic volumetric expansion. Simulation results are presented which show the importance of correctly accounting for these effects which designing subsea well control systems, particularly for systems where there is no subsea hydraulic accumulation. Abstract: Oceanographers from the Plymouth Marine Laboratory, together with colleagues from the Southampton Oceanography Centre, University of Plymouth, University of Oviedo (Spain), National Aeronautics and Space Administration ( NASA, USA) and Brookhaven National Laboratory (USA) have started a programme of research which consists of a series of transects of the Atlantic Ocean between the United Kingdom and Falkland Islands. The primary aim of the research is to measure physical, chemical, biological and optical variables in the upper 200m of the water column along the 12000 km transect in order to characterise the Atlantic Ocean over broad spatial scales. This will help further the understanding of the role of the world’s oceans in carbon cycles and provide valuable information for the calibration and validation of satellite remote sensing (i.e. for ocean colour and surface temperature of the oceans. The use of ‘ships of opportunity’ is essential to carry out broad scale research, and the development and use of new technology is an important part of this process. This report reviews the key issues and the relevance of such research and also highlights the new generation of technology that is required to work at these broad spatial scales. The data presented here are generated at sea in ‘real’ or ‘near real’ time and they define the areas of greatest plankton abundance and productivity, as well as regions of hydrographic contrast. In turn this will allow a more focused and targeted strategy for intensive sampling and analyses. The role of the oceans in interacting with atmospheric carbon dioxide (one of the so–called greenhouse gases) is also discussed. Abstract: The Optical Plankton Counter (OPC) is an optical instrument capable of large scale, rapid and continuous counting and sizing of zooplankton. A towed and a laboratory version of the instrument is available. 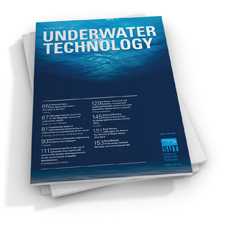 A novel application of the laboratory model, in underway mode using a ship’s uncontaminated sea–water supply, is the subject of this paper. The work was carried out aboard the RSS James Clark Ross, the British Antarctic Survey (BAS) research and supply vessel, on her annual voyage south from the UK to the Falkland Islands during September and October 1995. The instrument and its application are described, together with a review of some of the operational issues arising from such an application of the instrument. Samples of the data are presented, to illustrate the scale of sampling possible with the system compared with traditional methods. Some validation data from laboratory microscopic taxonomic analysis are also presented. Abstract: The effective and successful use of titanium in subsea applications requires the recognition, understanding and correct application of the combination of useful and unique physical, mechanical and corrosion resistant properties of titanium and its alloys. These properties are reviewed and guidance is given on design, and fabrication using available products and cost–effective manufacturing methods.